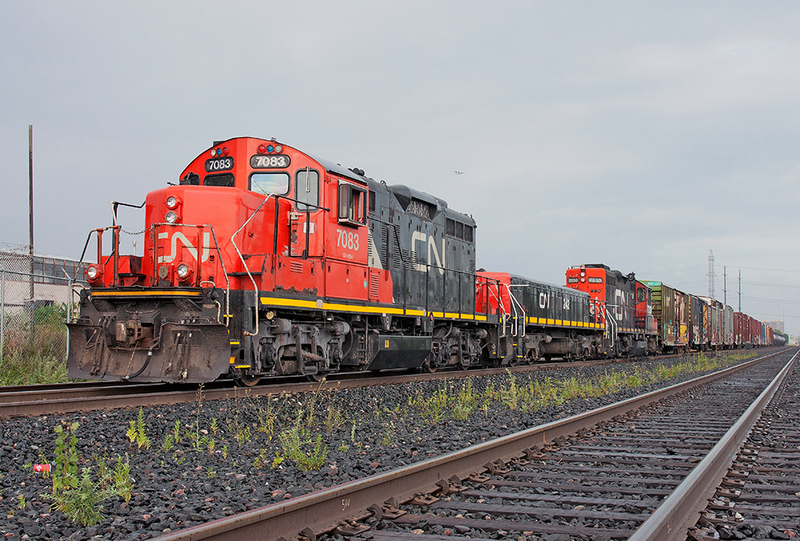 Railpictures.ca - Michael Da Costa Photo: Not often does a 7200 series GP9 yard set make it out onto the mainline, but today the exception was made instead of waiting for the 4138 to come off the shops to be mated to the 7083. I decided that a pull down set would be better than waiting 2+ hours in the yard. A few phone calls were made and off we went with a triple set, 7083-242-7230! A quick photo shows all three units at the ready waiting to head back to Mac Yard with 27 cars in tow. | Railpictures.ca – Canadian Railway Photography – photographie ferroviaire Canadienne. Caption: Not often does a 7200 series GP9 yard set make it out onto the mainline, but today the exception was made instead of waiting for the 4138 to come off the shops to be mated to the 7083. I decided that a pull down set would be better than waiting 2+ hours in the yard. A few phone calls were made and off we went with a triple set, 7083-242-7230! A quick photo shows all three units at the ready waiting to head back to Mac Yard with 27 cars in tow. So true. Sarnia still has their fair share of these and they do often make it on the mainline, not for long though! Nice, slugs sure are getting rare, at least in Montreal.